This is my first blog entry since April 2014, I'll get to that later. After three months of rehab and recovery from spinal surgery, I returned to work for one week. I already had a scheduled vacation to go to Las Vegas, again. I had a truly spectacular week seeing my entertainer friends and was welcomed by all at their venues. Good entertainment, good food and good "beverages" and all of this OFF the Strip. First on my dinner list was the Italian American Club on East Sahara. As soon as you walk in the door to this place, you're back in 1957 Vegas but without the cigarettes! Business casual, no. People actually get dressed up to come here, which I found pretty unbelievable in this day and age. The Club, originally private, was built to serve the growing Italian population. Years later it was opened to the public, but still offers a membership if one chooses for restaurant discounts and functions. This night, a friend, Carmine Mandia was performing. When I walked in, the place was busy. I nodded and gave him a small wave. He stopped in the middle of his Bobby Darin song and blared out; "Ricky Sachs is in the house!" I was completely floored by this and was thinking that the patrons were thinking "Who the hell is this guy?" That made me feel welcomed Las Vegas style. By the way, I do tell jokes but definitely cannot sing! Dinner was veal milanase, a couple of handcrafted cocktails and lot's of schmoozing. This Jew became Italian for the evening. My second dinner of the week was at Toscano Italian Steak House on Paradise Road. Previously a Ruth's Chris Steakhouse this is a very large restaurant and bar although from the road you can't see it. That's probably why it it was "formerly" a Ruth's Chris. Michael DeLano was singing here tonight and I had a dinner reservation, for what else, a superb filet mignon but with an appetizer of outstanding tuna tartar. Again, I walked into the bar area where Michael was singing and he stopped singing and yelled out; "Ladies and gentlemen, it's Ricky Sachs!" I thought to myself, "Again??" Unreal. Michael and I shared more than a couple of glasses of wine and it was just great. As with Carmine at the Italian American Club, everyone is welcome to sing by the headliner and it's an impromptu free show. Professional singers and entertainers, it's great AND you never know who will show up. Craig Canter was at The Barrymore with his special guests Neil Diamond and Englebert Humperdink who, by the way, sing as good as Craig! During the music I shared a drink with Frank Sinatra (Gary Anthony) and his manager Pam. Craig is a character...but of course, he's from New Jersey like me! Also playing at the Barrymore is Mr. Joe Vento. Joe is 96 years old (still drives!) and is a encyclopedia of music. He has played with everyone who is anyone from the beginning of time and has his own band in Los Angeles with many of the musicians from the Tonight Show with Johnny Carson. When you see Joe coming down the road GET THE HELL OUT OF THE WAY!! Kidding Joe. 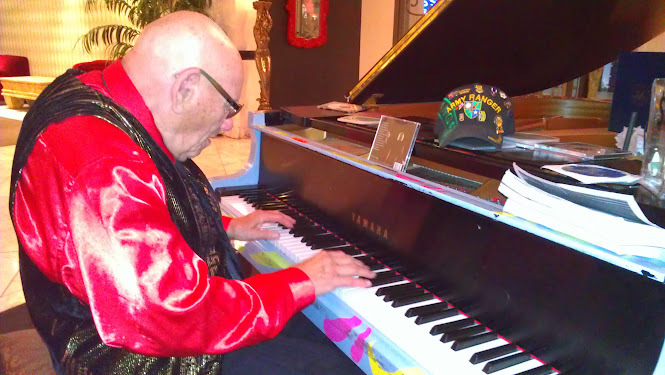 Joe is a WW2 Vet who was at Normandy on D Day and proudly wears his hat that sits on the piano. 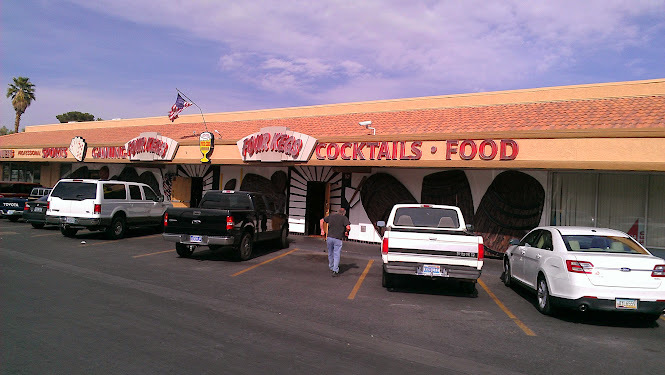 Other restaurants visited this time around were "as seen on tv"; Bacon, formerly Kelly's, in North Las Vegas was on Bar Rescue and Four Kegs from Diners, Drive Ins and Dives. Four Kegs was actually good. I say that because many restaurants that I have visited from DDD were not. 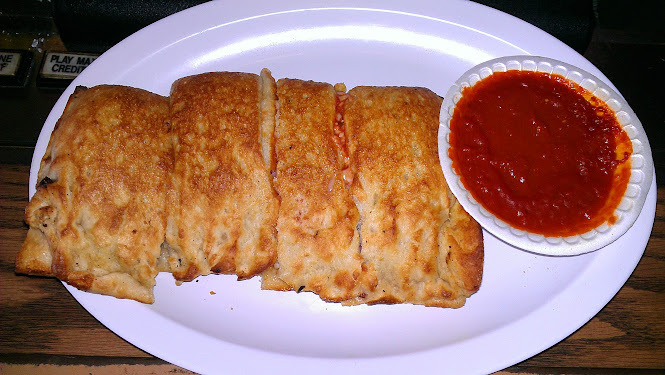 Stromboli at Four Kegs. You can't tell from the picture, but it's big. Excellent sauce and nice people here from the neighborhood. As I stated earlier, this vacation to Las Vegas was the best one yet. My friends welcomed me, I had very good time, treated to excellent entertainment and everything is first class all around. After returning home and returning to work for one week I had a burning in my chest...a heart attack. The pain subsided enough for me to take a shower and drive myself five minutes to Hackensack University Medical Center. If you get sick in New Jersey, this is the place you want to go. I had one stent put in and was told that I had 100% blockage in one artery. After the initial shock of "this is the end of my life" and several days of slight depression, I'm happy to report I'm normal again. It took me since April to finally write this. So much for the theory of red wine is good for heart!